Everyone seems to have their favorite grilled food...ribs, chicken, pork, beef, seafood and any combination of vegetables. Just mention barbecue and people lick their lips and begin to salivate! We used to do our outdoor cooking on a charcoal grill. It was always an adventure to see if those briquettes would be glowing and hot when we wanted to start the cooking process, or if, upon checking them, we would find stone cold pieces with just a hint of gray ash where they had started to catch fire and just gave up. With the advent of gas grills, temperamental charcoal became a thing of the past for our home. In spite of having to sacrifice the smoke-flavor, the other benefits were tremendous...we could instantly start the grill and use it for year-round cooking, the timing and temperatures were more precise and we would never have to clean out ashes again! One of my favorite memories concerning a grill came about by accident. The night before our school Christmas vacation was to end., we had a tremendous snow storm. We woke up to a very cold house and unresponsive electric appliances. My father headed to the garage and brought out the bag of charcoal he had stored the previous fall. After the coals in the grill were ready, he proceeded to make bacon, eggs and toast. To this day, I think those were the best eggs I have ever eaten. They had a smokey flavor that seemed to make that whole freezing ordeal better. I wish I had told my dad how much I loved those eggs he had cooked for us on the grill...we never had them fixed like that again. flavored sauce which smothers the chicken while it bakes. You will love this recipe! Preheat oven to 375 degrees. In a small saucepan, heat oil over moderately high heat. Add onion and cook for 5 min. until onion is tender. Stir in ketchup, brown sugar, vinegar and Worcestershire sauce. Bring to a boil. Lower the heat and simmer, covered, for 10 min. Remove and discard chicken skin; cut chicken into pieces. Rinse chicken, drain and pat dry. Arrange pieces in a lightly greased 13x9x2 baking dish. Spoon sauce over chicken, cover with foil and bake for 20 min. Uncover, and bake 20-25 more minutes more or until chicken is cooked through. Remove pieces to platter and spoon sauce from the pan onto chicken. Serve. 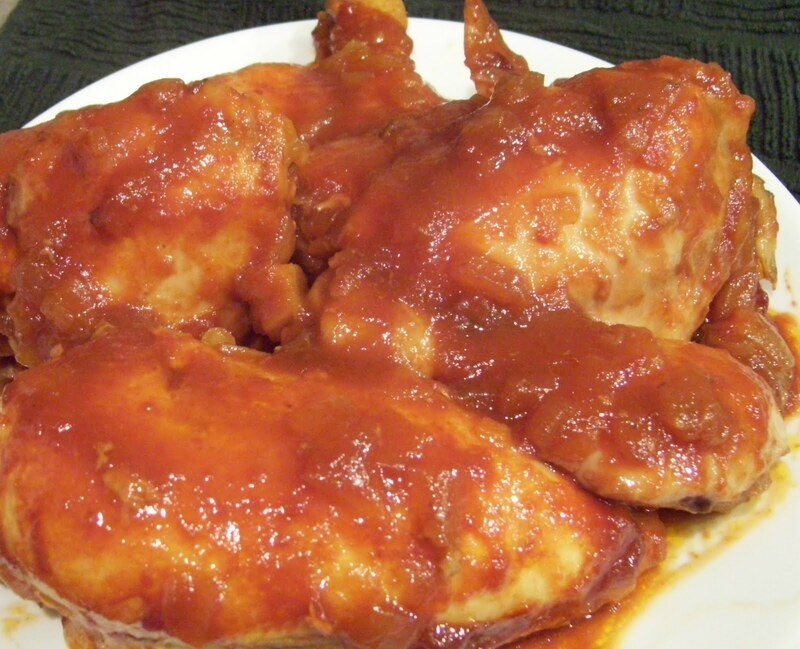 *Chicken is done when the meat is tender and can be pulled easily away from itself or the bone. **If you do not care for dark meat, substitute chicken breasts for the whole chicken. Side dishes: Serve with a buttered, baked potato and a steamed vegetable or hot baked beans. Of any chicken recipe ever made this one is the best. The sauce is so good I always have Holly double the recipe. This is a wonderful recipe and easy to make. We have it with cheesy rice and a vegetable. And as Tony mentioned we double the sauce recipe because we love the sauce!! Great memories.